This item describes a procedure of attaching and using a recording device to record graphically the movements the jaw. The graph shown is a side view of a typical movement of a lower moving in relation to the upper jaw. RCP – Retruded contact position is where the condyle of the mandible (lower jaw) in in the centre of the jaw joint space and is opposing the depression in the upper jaw called the mandibular fossa. 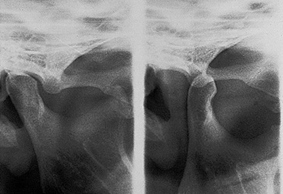 This is shown in the image of the xray of the joint. ICP – Intercuspal position is where the condyle has move up the front edge of the depression to a raised area of the upper jaw bone called the articular eminence. This movement is to achieve maximum contact with all the teeth. 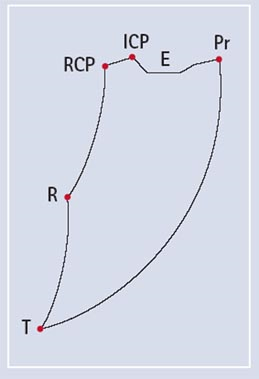 Ideally this movement should be as little as possible between the RCP and ICP because a lot of pressure is generated in this small movement especially if you clench. This puts strain on the joint and overactivity in the muscles leading to spasms and pain. This movement between the RCP-ICP is termed a slide. The greater the slide, the greater the area of pressure, that can be exerted on the teeth. The slide stops when most of the teeth meet. Careful adjustment of the teeth can reduce this slide. E – Edge to edge position of the incisors as the lower jaw’s front teeth ride up the back surface of the upper front teeth to meet the biting edge. Pr – Maximum protrusion is the further point the mandible can move forward along the articular eminence without opening. R – Maximum opening of the mandible while the condyle is still within the mandibular fossa. The arc of movement from the RCP to R is independent of the position of the teeth and is reproducible. This often used for patients without teeth in the construction of full dentures. This movement is like a hinge. T – Maximum opening of the jaw at the peak of the articular eminence which is at the most forward position of contact with the upper jaw. This is shown in the image of the xray of the joint. Generally people tend to have a favourite chewing. Tracing can identify abnormal movements. The jaw joint is an adaptable structure. It needs to be as people lose teeth, wear them down, or have dental treatment that changes the bite. There are habits such as clenching and grinding of teeth that it also has to contend with. Occlusal therapy aids the jaw joint to adapt or protect it from these changes or habits.